An excerpt from Fraser Rae's Newfoundland to Manitoba, 1881. Winnipeg, the capital of Manitoba, surprised me more at first sight than any one of the countless cities which I have visited on the North American Continent. The older ones frequently surpassed my utmost expectations; the younger as frequently fell below the most moderate estimate which I had formed of them in imagination. Indeed, a pretentious city in the Far West is commonly on a par, in external appearance, with a paltry village elsewhere. I had read much about Winnipeg before visiting it, and the impression left on my mind was not favourable. The Earl of Southesk, who was here in 1859, writes that "there were houses enough to form a sort of scattered town." Lord Milton and Dr. Cheadle, who followed him three years later, saw nothing worthy of note. 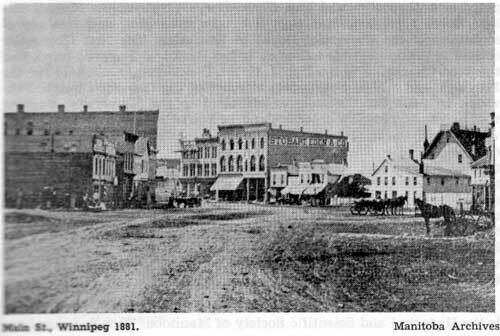 Captain Butler, who paid it a visit in 1870, refers to it, in his "Great Lone Land," as "the little village," and "the miserable-looking village of Winnipeg." I knew that changes had been made since Captain Butler came hither on duty connected with the Red River expedition under Colonel (now Sir Garnet) Wolseley; but I was not prepared to find that they had been so great and startling as those which I actually beheld. Walking down Main-street, on my way to the Pacific Hotel, I could hardly realize that I was in a city incorporated so recently as 1873 and supposed to be far beyond the confines of civilization. The street is 132 ft. wide and it is lined with shops, churches, and public buildings which would do credit to a much older and more famous place. The solid look of the majority of the edifices is as noteworthy as their ornamental de-sign. They are built of cream-coloured brick. It is at a comparatively late stage in the growth of a western city, either in the United States or Canada, that the buildings are composed of anything but wood; hence, a stranger in one of them is apt to arrive at the conclusion that the buildings are erected for a temporary purpose. Here, however, the effect is the reverse. The Town Hall and the Market, the Post Office, the Dominion Land Office, and the Custom House, to name but a few of the public edifices, are as substantial buildings as can be desired. No one looking at them can feel here, as is so commonly felt in other places of rapid growth on this continent, that the citizens apprehend their city will decay as rapidly as it has sprung up. While the progress of Winnipeg is one of the marvels of the Western world, there is good reason for believing that it will continue at an accelerated rate, and that Winnipeg will hereafter hold in the Dominion of Canada a place corresponding with that now held in the United States by Chicago. In 1870 there were 300 people in the miserable-looking village of those days; now, the population is approaching 15,000. There are eight churches - one belonging to the Roman Catholics, three to the Episcopalians, one to the Presbyterians, two to the Wesleyan Methodists, and one to the Baptists. There are several schools and colleges - two common schools, St. John's College Schools, for boys and for girls; a Central School; St. Mary's Academy; Manitoba College, in connexion with the Presbyterian Church, and a Wesleyan Institute. Most remarkable of all, if not altogether exceptional among seminaries for the advancement and diffusion of sound learning, is the University of Manitoba. It grants degrees in arts, sciences, law, and medicine. Its governing body is composed of representatives of religious societies which have not succeeded in working harmoniously for a common end in other parts either of the Old or the New World. The colleges affiliated to it are the Episcopal College of St. John, the Roman Catholic College of St. Boniface, and the Presbyterian College of Manitoba. Others may and are expected to join a University which, if as successful as it deserves to be, will become a model for other places, both on the North American continent and on the continent of Europe. The governing body consists of a Council, composed of a Chancellor and Vice-Chancellor, representatives of each college, three representatives elected by the graduates, and two representatives of the Provincial Board of Education. The first Chancellor chosen to preside over the Council is the Bishop of Rupert's Land, and the Vice-Chancellor is the Hon J. Royal, the Secretary of State for the Province, and a highly-respected member of the Catholic Church. Pro-vision is made for the colleges affiliated to the University granting theological degrees. No objection can be raised to this by the most advanced and uncompromising educational reformer; indeed, the educational reformer would be hard to please, if he were not satisfied with the constitution and government of the University of Manitoba. While those persons merit unstinted praise who have worked and made no mean sacrifices to render the University successful, the Legislature of the Province is equally worthy to be held in honour for having contributed to aid the experiment by endowing the University. Thus nothing has had to be paid by the colleges which are now in connexion with it, nor will those which may hereafter become affiliated to it have to provide any funds. Another institution which I did not expect to find in so young a city is the Historical and Scientific Society of Manitoba. Though it has been only two years in existence, this Society has rendered a service to the Province by collecting its records, exploring its Indian mounds and collecting specimens wherewith to illustrate its mineralogy and geology. It is unfortunate that the Society could not persuade the Hudson Bay Company to spare old Fort Garry, instead of levelling it to the ground and using the stones to form the foundation of a new store. However, the Company have wisely presented many volumes of records to the Society's library, where they will be safely kept, and accessible for study. From a personal inspection of the works in the library, and the curiosities in the museum, I can vouch for a good beginning having been made, and I have no doubt that, if the members continue to display the same energy, the Historical Society will prove of infinite advantage to the inhabitants of the Canadian Far West. 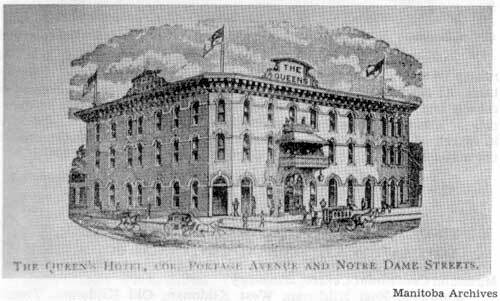 The Queen's Hotel, corner of Portage Avenue and Notre Dame Street.